Celebrate With Me! 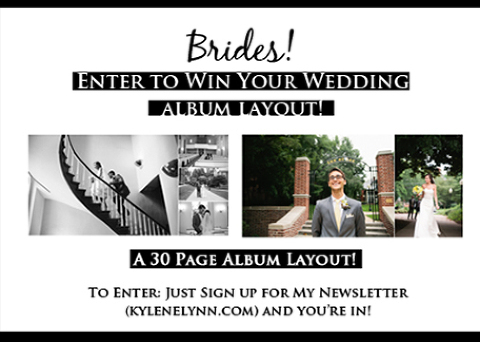 Enter to Win a 30 Page Wedding Album Layout! It’s my birthday long weekend (a Thursday- Sunday birthday is normal, right?) and since my love language is gift giving… I’m giving stuff away! And good stuff. Like an entire 30 page wedding album layout! This is solely for wedding couples I have captured – past, present and future! If I’ve shot your wedding (or will be this year) just sign up for my newsletter (see that black tab in the upper left corner – click there!) and you will be entered to win! Enter right now and the winner will be announced tomorrow morning! Then check back and see what the next give away is!